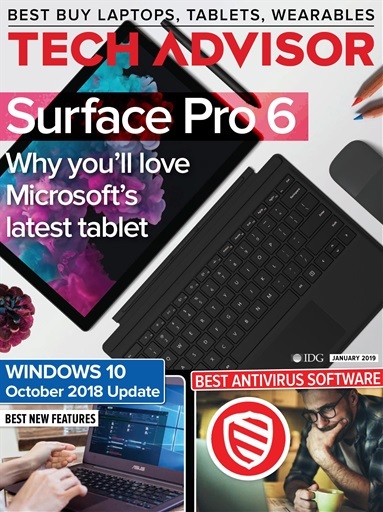 In this month’s packed issue we review Microsoft’s latest tablet – the Surface Pro 6. With a stylish design, improved performance and fantastic battery life, it’s a great choice if you’re after portable Windows computing. We also look at Windows 10 October 2018 Update’s best new features, while our handy tutorial explains how to manage Windows 10 updates. If you’re worried about your PC’s security, then our buying guide to the best antivirus software will help keep your computer safe. Plus, we’ve our usual reviews of the best new products, including Google Pixel 3, Huawei Mate 20 Pro, Apple iPhone XS, Google Home Hub, and Kaspersky Total Security 2019.